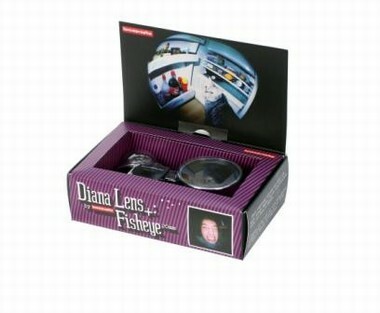 The super-wide interchangeable Fisheye lens for the Lomography Diana+ cameras. Each shot yields a 180° circular image on a square print bursting with the Diana+s saturated colours and dreamy atmosphere.This enormous field of view takes in half of the world around you and compacts it into a tight circular image. Barrel distortions twist and bend your subjects around the edges, stretch them towards and away from your lens, and converge their lines towards the center. Get right up to your subject's face, and watch their nose get sucked into your lens while their ears and forehead s-l-i-d-e backwards. Each fisheye image shows massive depth of field, so your subject and background will be nice and crispy clear. A Fisheye Viewfinder and plastic mount is included to preview your shots. Compatible with all Lomography Diana+ and Diana F+ cameras.